The Friends groups at many of our libraries have ongoing book sales or book sale events. Find great deals and support your library at the same time! These sales are coordinated by Friends groups as fundraisers. They welcome gently used materials in very good condition. See the listings above for donation guidelines, hours, and contact information. Items that are NOT accepted include: encyclopedias; text books; dated material over 2 years old (i.e. travel books, computer books, magazines, romance series like Harlequin, etc. ); seminar or corporate manuals; video and cassette tapes; vinyl LP records; anything with mildew, water, food, or insect damage, broken spines, torn pages, highlighted text or other interior marking on pages. MSU Public Recycling Dropoff, 468 Green Way (Farm Lane and Green Way), East Lansing (517-355-1723) They attempt to re-sell or donate before recycling. 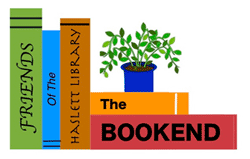 Friday May 17, 2019 2:00pm - 5:00pm Holt-Delhi Get bargains on new and used items-books, DVDs, CDs and audiobooks (while supplies last). Proceeds benefit the library. Saturday May 18, 2019 10:00am - 2:00pm Holt-Delhi Get bargains on new and used items-books, DVDs, CDs and audiobooks (while supplies last). Proceeds benefit the library.